It's the End of the Road for THFF. After 4 years of blogging, I've come to the conclusion that I'll no longer be writing new content for THFF (at least for a while). 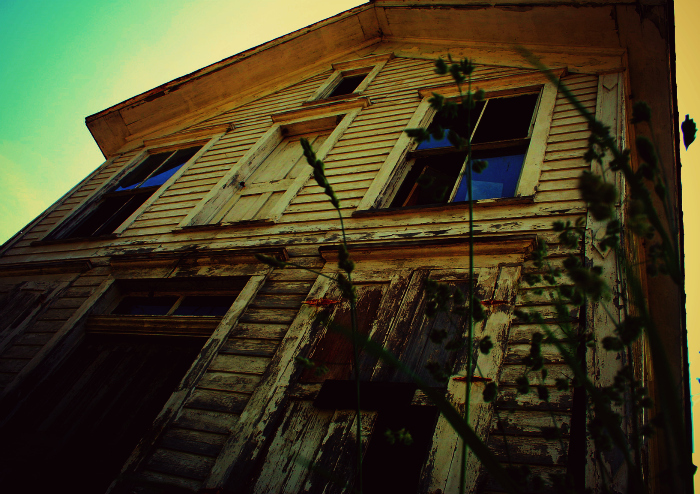 The blog will still be up though. Feel free to search previous posts and articles. Through THFF and fly fishing, I've met a lot of incredible people. I've shook hands with people I would have never in a million years thought I'd shake hands with. Once things start slowing down in this crazy life of mine, THFF may or may not be resurrected. It may be sooner than later, it may be several years from now. I've been concentrating intently on music (if you follow me on Twitter or Facebook, you can clearly see this!) It's taking up a huge portion of my life. With that being said, I still fish... I'll never let fishing go. It's in my blood and it's part of who I am. We've got less than 36 hours until Delayed Harvest picks back up once again! For all of you DH fans, it's a relief. DH waters are usually easily accessible and are full of fish. The opening of all of these waters will give us anglers more variety and more to chose from. Not all waters will be stocked on October 1st. Check the stocking dates here. This year, we have 4 additional waters that were added to the list. Spring Creek in Madison County, Ararat River in Surry County, Coffee Lake in Watauga County, and Elk Creek in Wilkes County. Once the fish have been stocked, they'll be grouped up and not very smart. Once you find the fish, you're in for a field day. Eventually, they'll spread out and become smarter. A generic beadhead nymph would be my go to pattern. Prince Nymphs, Hares Ears, Tellicos, and Pheasant Tails will work well. If you're not hooking up, or getting any strikes, chances are you're not getting down deep enough. Add a split shot or two and adjust accordingly until you hit the jackpot. For the past week I've been down in Florida soaking up the sun, the smell of salt in the air, and the fishing. Which were all abundant. If you haven't heard, the Sunshine State is Heaven on earth for anglers! There's plenty of opportunities for fly anglers too. I took those opportunities and did what I could to make the best of them. Given I fish freshwater 99.9% of the time, saltwater fly fishing was an entirely different world for me! 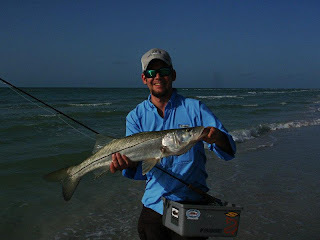 Last Thursday, I fished with former Davidson River Outfitters guide Josh Almond down on Sanibel Island. Big snook lurking just inches from shore were on the menu from sun up until about noon. Fish upwards of 30"+ were cruising just below the waves. As fly fisherman, Josh and I were following these fish along the shoreline in attempt to lure them to our white Schminnows and Clousers. Like mentioned, snook were the main course on the menu, but bonnetheads cruising in the shallows sidetracked me several times. One of them, which Josh spotted making a beeline for shore, pushed 4 ft. As the shark got within 10 ft, I tossed my Merkin Crab out ahead of his path. He turned and inspected my fly, but quickly rejected. 30Ib mono would have been useless in landing him, but the 5 second fight would have likely been worth it! Josh landed a very nice snook (see pic below) the previous day, but we failed to find snook that were willing to eat on Thursday morning. Josh with a pig snook!! 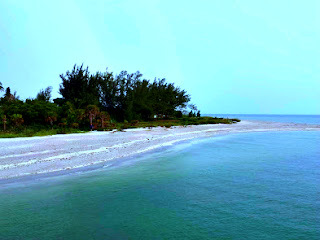 Later that day, it was time to fish one of the jetties on the island. Other than a run in with some manatees and Josh's fish being "baracuda'ed" right at our feet, we didn't get into anything substantial. It was still one of the best days of fishing I've had in a while. Sometimes catching isn't nearly as exciting as the things you experience while fishing. nasty storm. The tide was just rolling in and baitfish were moving in by the thousands. I tied on a Schminnow, and fished it just below the surface. Strip, strip, strip, stop. Strip, strip, stop. Nothing. As soon as the fly hit the water on the next cast, a streak of silver shot out of the water and my rod bent. Baby tarpon? 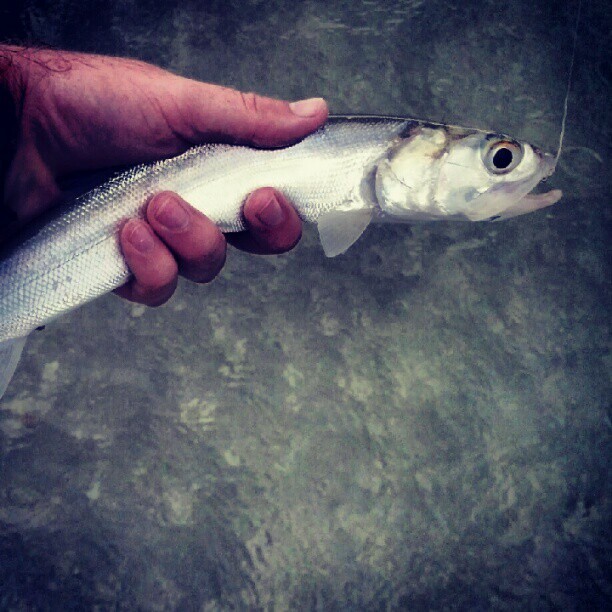 It was close enough... A close cousin to the silver king, the ladyfish. Just like the tarpon, they seem to stay in the air more than the water. They're not 200Ibs, but they're an absolute blast to catch on the fly rod. After a few more on the fly an approaching storm and dusk drove me off the water. In my book, it was an excellent finale to the trip. Big fish are fun, but sometimes the little guys can light up the day. It was a nice change of pace! 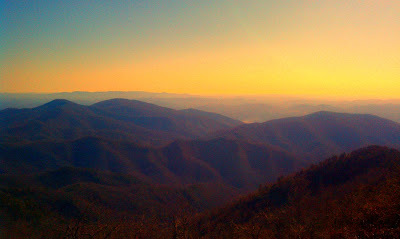 In the end, it's good to be back in NC. Fellow Carolina angler/tyer Jule McDowell shows us how to tie a generic shad/baitfish pattern that I'm confident will put fish after fish after fish in your net. This fly says big fish (and multiple fish) all over it. (Video produced by Buddy Price. You can view the rest of Buddy's videos on his Youtube channel, FlyFishVideo. Red Hot Fishing Out There! 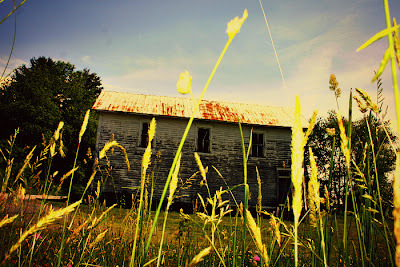 I'll admit it, a very busy schedule has left me no time to blog, fish, or ultimately have a life. Now that things are starting to calm down a bit, I'm hoping to post (and fish) more. Judging by all of the reports I've been seeing on social media and numerous blogs, fishing is red hot right now. 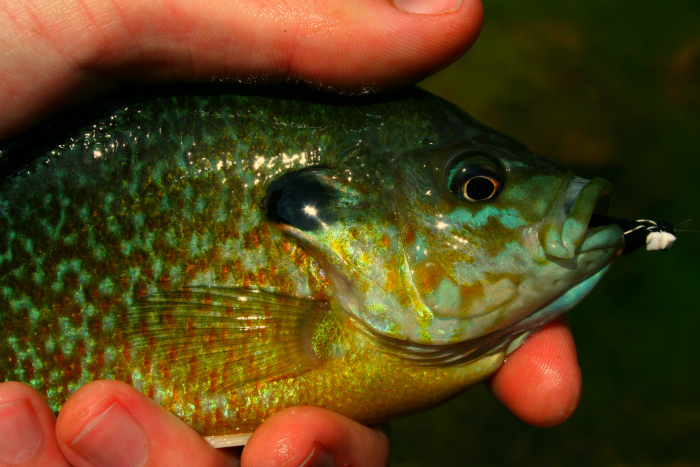 There's a whole list of bugs that are hatching, temperatures are perfect, and the fish know it. Get out and enjoy if you can! If you want to get away from the crowds, try fishing a nearby wild stream. They're fishing well right now and as long as the drought doesn't get too bad, they'll continue to fish well. Take a small box of dries (maybe a Green Weenie or Tellico Nymph on the side) and start counting fish. Try a yellow Stimulator, Yellow Para Adams, Yellow Elk Hair Caddis, PMX, Trude, or a Turk's Tarantula. 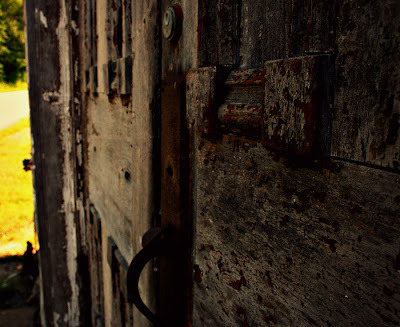 Yellow seems to be the color of choice right now. The DH waters were recently stocked and should contain plenty of fish. Most generic patterns will serve you well. Try a #12-14 yellow Stimulator, #16 Elk Hair Caddis, #14-16 Yellow Para Adams, #14-18 Copper John, #14-18 Pheasant Tail Nymph, Green Weenie, Squirmie Wormie, etc. Send in your NC fish pics and I'll slap them on the THFF Fish Wall! It's not Photoshopped folks. 17 year old Tyler Shields was expecting a leisurely afternoon out on Hiwassee Lake with a couple of buddies, but that leisurely afternoon on the water turned into something I'm sure he'll never forget. On 10 pound test and an open face reel, Shields reeled in a state record 66 pound striper, that shattered the old NC record of 54 pounds set back in 1991. The most impressive thing is the fact that the fish was less than 2 pounds shy of the world record freshwater striper. Read the story here. Awesome job Tyler! It seems as if I've been tweeting about everything BUT fishing on my personal twitter page. To fix that, I've created a separate Twitter account dedicated to fly fishing in the Tar Heel State. I'll do my best to tweet daily tips (might not be every single day though at times), along with fishing info, pics, and more. If you'd rather see all fishing tweets, @CarolinaAngler is what you want to follow. 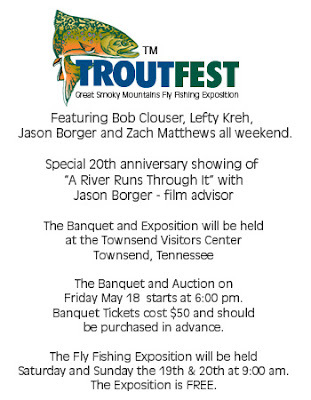 Troutfest 2012, one of the largest venues centered around fly fishermen, is right around the corner! This year, the expo will be held on Friday, May 18th, and Saturday 19th/Sunday 20th. The banquet/auction is being held that Friday evening and the expo kicks off on Saturday at 9:00am. Bob Clouser and Lefty Kreh will be there again this year. Unfortunately Joe Humphreys won't make be able to make the trip down to TN. We'll miss him, but we'll look forward to next May. Troutfest is all for a good cause, too. 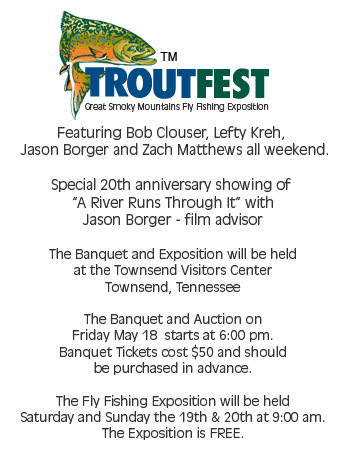 All proceeds go to the Great Smoky Mountains National Park Fisheries Department where they'll be used to maintain and improve fish habitat within the Park. I will be there that Sunday from 1-5pm as a fly tying demonstrator. Learn to tie my Extended Body Inchworm, Vinyl Rib Stone, several semi-realistic patterns, and more! Almost feels like summer out there. Almost. Heat, followed by afternoon storms makes you question the time of the year. Thankfully, the humidity has been relatively low lately, though it's beginning to creep up (52% humidity in Asheville with a temperature of 65° at the 11am observation). The temperatures—which are well above average—are making things feel more like early summer. No wet wading just yet (that water is still going to be chilly) but sooner or later, waders will be overkill and wet wading will be the way to go. Of course the temperatures will be the deciding factor. So far, so good. Temps will fluctuate as they normally do in the spring as warm air ahead of the cold fronts is replaced by dry, cooler air behind. Regardless, the weather is absolutely spectacular! Excellent weather makes for some excellent fishing. You simply can't beat the conditions right now. DH waters are stocked and ready to be fished. 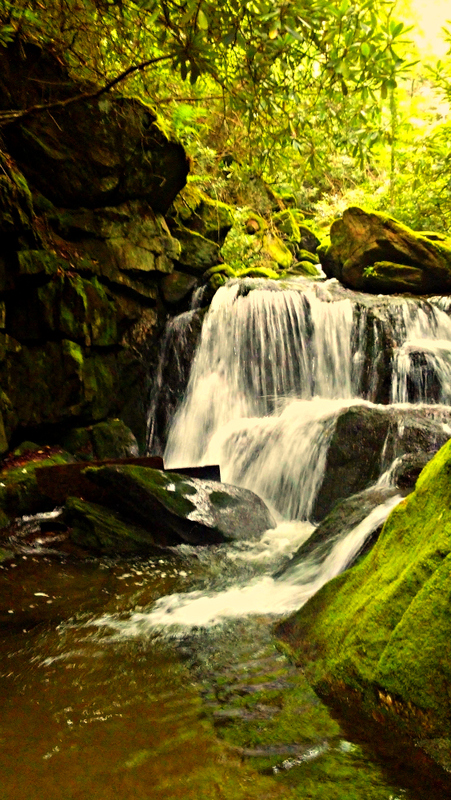 Wilson Creek, Stone Mountain, and the North Mills, would be my top 3 DH waters. If DH fishing isn't what you're after, check out the Nantahala tailwater or the C&R section of the Davidson River. I'm confident this weekend will be crowded on most rivers given the warm weather. I'd get there early if possible. 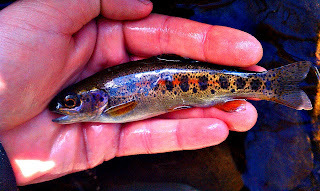 Wild waters will eliminate the crowds, so if you don't mind catching a ton of 7" vibrantly colored wild fish, small streams should treat you very well. As far as flies go, nymphs in the morning and dries in the afternoon will be the ticket. Quill Gordons, Blue Quills, and caddis are all hatching right now. Try an emerger when you notice the first bugs starting to come off of the water. Fish will usually pick them off first before gorging on the adults. Eventually, once the hatch is well underway, switch to a dry and watch the fish rise to meet it! With all of this being said, the best advice I can give you is this: GO FISH! This morning's Charlotte Observer... Gas prices. College basketball. Hollywood. Academy Awards. Brook trout. Daytona. Wait... Brook trout? Yep. My eyes immediately deviated from the headlines to the words "brook trout" in a split second. It's pretty cool that our beloved brook trout is getting some face time in the largest newspaper in North and South Carolina. Check out the article here. Joan Rivers Hits the River. It Hits Her Back. Ironic her last name is "Rivers". Our friends at Montana Fly Co. tweeted the article this morning and it's been floating around social networking sites all day. 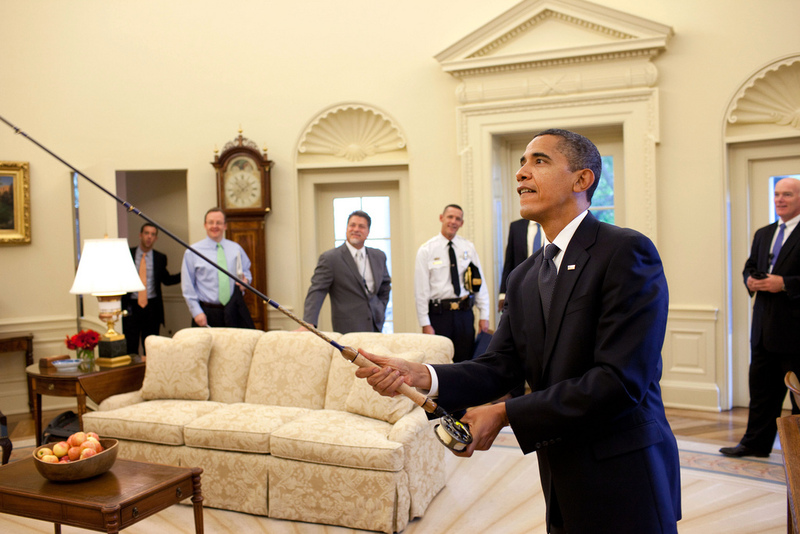 Fly fishing receives a considerable amount of attention amongst celebrities. Notable celebrities who fly fish (or fly fished when alive) include President Obama, Jimmy Buffet, Eric Clapton, Dierks Bentley, Luke Bryan, Ted Williams, Dwight D. Eisenhower, Harrison Ford, Jimmy Carter, Ted Turner, George H.W. Bush, George W. Bush, Ernest Hemingway, Andrew Carnegie, Henry Winkler, Liam Neeson, Brad Pitt, Bing Crosby, Woody Platt (lead singer of the popular Brevard, NC based bluegrass band the Steep Canyon Rangers), Richard Nixon, and now..... Joan Rivers. Female fly fisherman are noticeably increasing, celebrity or not. 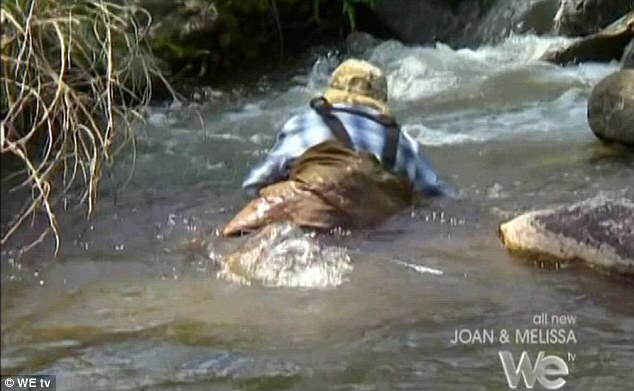 Paula Deen was guided on an NC river several years ago. With all of that being said, celebrities (that aren't the "outdoorsy type") and fly fishing seem to always end in either choas or humility (or at least that's the pattern I've been seeing recently). On the other hand, sometimes it goes smoothly. In Joan's case, it was everything but smooth. I think Joan's dignity is floating around on that Wyoming river. She probably hasn't found it yet. Poor Joan. Read the full article complete with additional pics here. 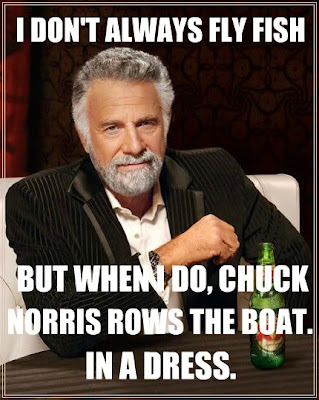 Most of you guys have probably seen the Dos Equis commercials revolving around the most interesting man in the world. Here's the world's most interesting fly fisherman, whipped up by yours truly. You're welcome, anglers. Early November was the last time I fished. The long "trout drought" finally ended today on a wild stream in WNC. I continuously asked myself if I still knew how to fish. It's been awhile! The tippet is the end of the leader, right? 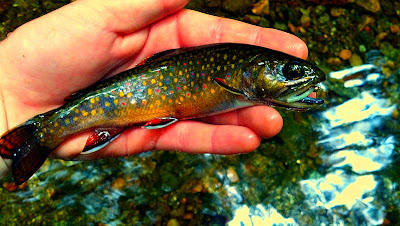 My initial plan was to fish for wild brookies. 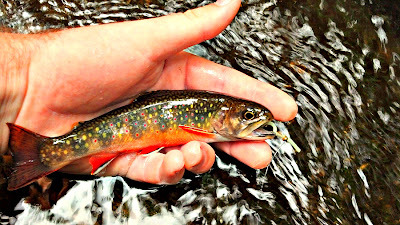 The Park Service closed the gates (and likely won't open them until spring), so I marked brook trout off of my list and resorted to fishing a nearby wild rainbow stream. 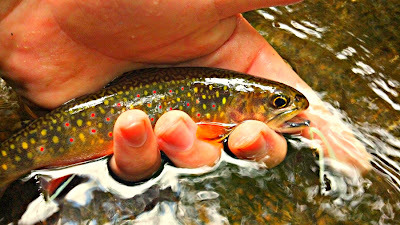 Wild streams can be hard to fish in the winter, as wild fish tend to be much more lethargic and secretive than stockers. The stream I fished—a small, 10ft wide tributary—looked fishy, but only gave up 1 vibrantly colorful wild rainbow and several misses. In my book, 1 wild trout in the winter, equals about 10 in the summer. Great day to be out on the water! More rain is forecasted to move in from the south and west this evening/overnight and into tomorrow. Most of WNC should be rain free by lunchtime, so if you're heading out to the river tomorrow, bring the wading jacket, especially before noon. A lot of folks have been asking if the fishing will be worthwhile this weekend, given the rain we're seeing. The short answer, is yes, as long as you play it safe. Rivers and streams will rise, as a general .75-1" is expected across many portions of WNC on top of the rainfall we've already picked up. I highly doubt the Davidson will spike to 3,000 cfs, or Wilson Creek will be completely blown out, but there will be plenty of water to contend with. Periodically check the water levels here. More water means streamers, large nymphs, and heavier tippet will serve you well (in most places). Try a San Juan Worm, Squirmy Wormie, Ooey Gooey Grub, Vinyl Rib Stone, or an egg pattern on 4x. If you're failing to hook up, don't immediately change your pattern, but tie on a smaller size. Anglers tend to initially reach for the larger sizes, because they're more visible (I'm guilty!). Usually it's a fly that's too big that strays fish away, not necessarily the pattern itself. Try a dropper. Tie on a larger, heavier nymph, such as a stonefly. This will act as your lead fly and will get both flies down to the bottom. Tie on a smaller fly behind your lead fly. A lot of times, the larger stone will attract a trout's attention only for the fish to settle for the smaller pattern trailing behind. If you head out, enjoy! Watch the water levels carefully! For some, it's solitude. Others agree it's an incurable addiction. Some folks will tell you it's not about catching fish, but rather it's spending time with family and friends that makes fishing worthwhile. If you put these reasons—along with many more—into a blender and mix it all up, the proverbial smoothie would be my reason. Over the years, I've had the opportunity to fish in numerous states, from Florida to Montana. I've found that catching fish isn't the only variable in the equation, although it is at the top of almost every angler's to-do lists. Fish aside, I find myself captivated by the scenery, the people, the experiences, the culture of the different regions you visit, the memories, the laughs, the time spent with loved ones... The list goes on and on. Everyone has their reasons, some unique, some shared by many others. Because you're reading this, I'm inclined to believe fly fishing keeps you sane. That roaring river, that tranquil lake, or that crystal clear bonefish flat, is likely your home away from home. It is for me. So, as an angler, why do you fish? 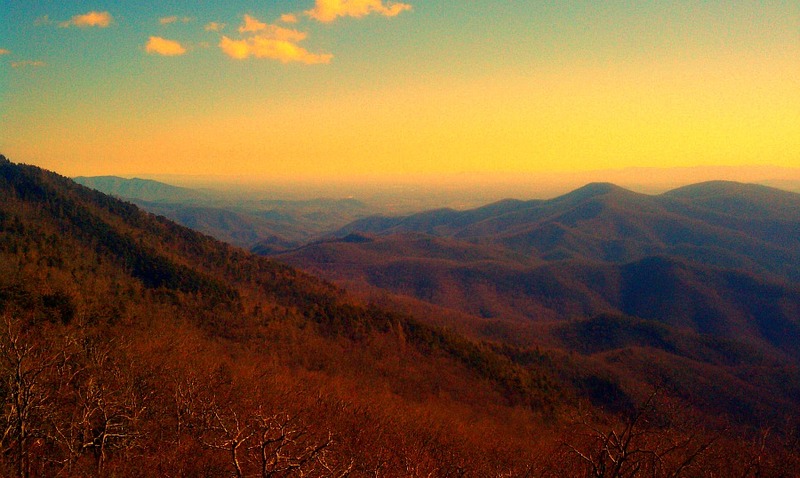 North Carolina has its fair share of unusual winters. 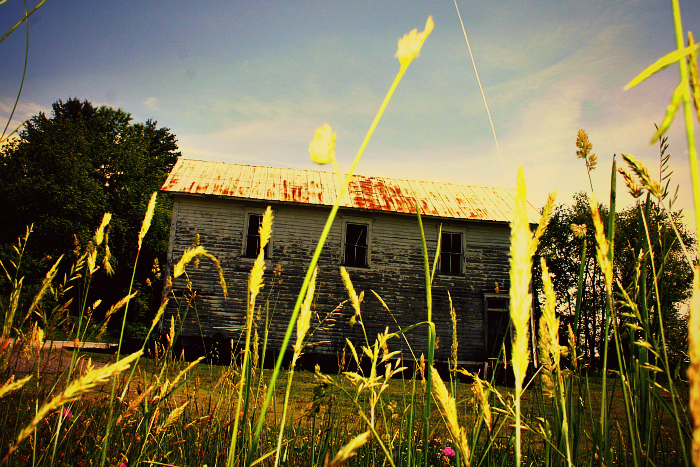 If you've lived here long enough, you're probably nodding in agreement. This winter has been nothing short of unusual. Snow, while the higher elevations have received some, has eluded most of us thus far and the bitter cold just won't settle in like it relentlessly did last winter. When you combine warmer-than-average temps and virtually no accumulating snow in most areas, you get some better-than-average fishing conditions... Usually. Sitting in an office, or sitting in class on days like today have you constantly dreaming about wading in a river somewhere. With a SW wind and full sun, much of WNC hit the 60s. Tomorrow looks even better, despite the chance for a few showers. Savor it while it lasts, because it looks like the cold is coming back. I'd get a trout fix while it's relatively warm. If you hit the DH waters, make sure you have an assortment of patterns. Princes, Copper Johns, Micro Mays, Pheasant Tails, Hares Ears, Hise's Hetero-Genius, Squirmy Wormies, San Juan Worms, Para Adams, Para BWOs, Woolly Buggers, Slumpbusters, and so on, should bring plenty of fish to your net. 6) The Smokies. Can't go wrong with fishing the Park. Whether it be the Oconaluftee, Big Creek, Cataloochee, Little River, Cosby Creek, or Abrams Creek, you should discover some decent fishing opportunities. If you get skunked, the scenery should make up for it, as always. Send in any fish pics you'd like to share on the THFF Fish Wall! Shoot me an email, or send them to me via Facebook, Twitter, or Google+.